This week felt like it was four months long. On top of all of the horrible things that happened in the country this week, Annabel is very sick with strep and pneumonia. We spent a lot of time in urgent care with her this weekend (why do kids always get sick on the weekends? ), and we’ll be spending more time with Dr. Looove tomorrow. 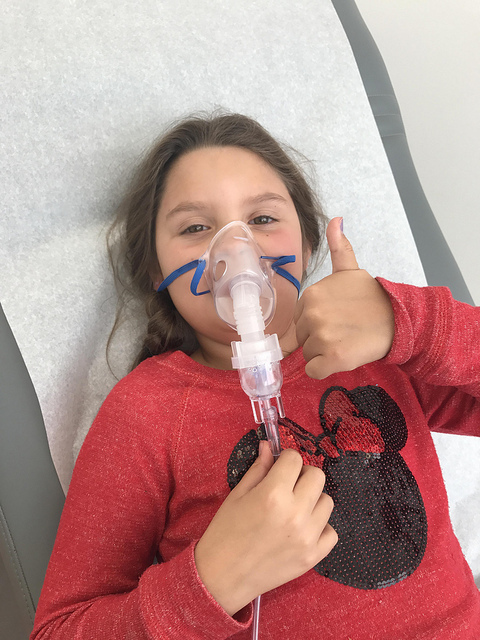 I’m trying not to spin out over Annie having pneumonia, but seeing her in a hospital bed getting a breathing treatment brought up some painful flashbacks. Hoping for a good visit with Dr. Looove on Monday. At least she’s still in good spirits, my sweet girl. ~Two strangers bond over country music and beer. Then the gunshots started. ~Darrell Hammond was SNL’s best Donald Trump – and its best impressionist ever. So what went wrong? ~This skull decanter is so cool. I never drink anything that needs to be decanted, but I’d take one for the team in this case. ~I think I need this skull cardigan. ~We just found a strong contender for Schuyler’s Halloween costume. I’m so sorry Annie is sick – I can see why this would be extra scary! Big hugs ? Poor Annie! I hope she starts feeling better soon. And of course this would be extra nerve-racking for you and Mike- I hope James is still healthy! And thank you for always doing these posts, even if your week has been crazy. I always love reading the articles and wishing I actually had the guts to buy some of the stuff! I’m not sure if she recently had the flu shot, but I wanted to let you know that my daughter fell sick with pneumonia as a side effect of the vaccine. It is listed as a tie effect and I did not know. Not writing this to start a vaccine debate, just wanted to let you know the cause for my child. I hope she is back to normal quickly! Everyone should know the side effects of vaccines and should also read the ingredient list. Thank you for commenting on this. I hope you got to see Dr. Looove today and that Annie is on the mend. Get well soon Annie! I’m sorry that Annie is so sick. I’m also sorry the seeing her in the hospital bed getting a breathing treatment brought up some painful flashbacks. Just so sorry. How’s Bel today? I hope she is better and you have better peace of mind. I know having those flashbacks has to be ridiculously hard. So so sorry. I hate it when our kids get sick. I hope she responds to medication and is better soon. I hope that Annie is feeling better and that you never have to see one of your children getting a breathing treatment again. Much love to all the Spohrs. Poor Annie and poor you!! Hoping she is better today. Of course it’s always a weekend or a holiday…usually a 3 day weekend in my world. Ugh! Thinking good thoughts and she looks cute as ever! So sorry she’s sick. Sending get better wishes to sweet Annie and wishing you peace. My kids are teenagers and I still stress so much when they are sick. Ahhh, poor Annie! I give my kids 1/4 teaspoon of sodium ascorbate mixed into juice 2x a day when they have been exposed to sickness or when they are feeing sick, and it works like a charm in getting them better quickly or keeping them from getting sick in the first place. It boosts the immune system. Hope Annie is feeling better soon! I’ve been a reader for years and my heart broke for you as soon as I saw the word pneumonia. 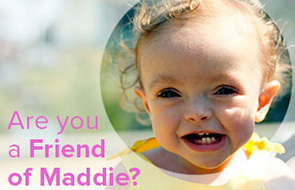 I can’t even imagine how hard this must be for you because of your history with Maddie. I’m sending lots of virtual hugs.